189. Snider, B. B. “Manganese(III)-Based Oxidative Free-Radical Cyclizations” in Transition Metals for Organic Synthesis. M. Beller, C. Bolm, Eds: Wiley-VCH; Weinheim, 1998, volume 1, pp 439-44. Alkenes and Glycals react with Mn(OAc3)·2H2O and NaN3 in 9:1 acetonitrile-trifluoroacetic acid to give 1,2-diazides in >80% yield. Allylic azides are formed by slow addition of NaN3 to a mixture of alkene, Mn(OAc)3·2H2O and Cu(OAc)2. (±)-Raikovenal has been synthesized in five steps from dihydrofilifolone by two Wittig reactions. A similar sequence provides (±)-preraikovenal. Epiraikovenal has been prepared by photolysis of preraikovenal. 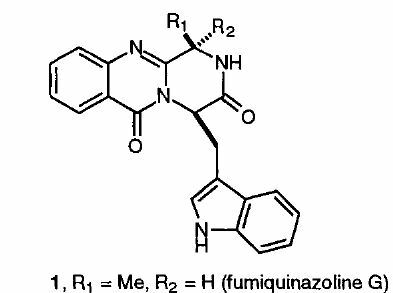 An efficient twelve step synthesis of (±)-fumiquinazoline G was achieved in 11% overall yield.